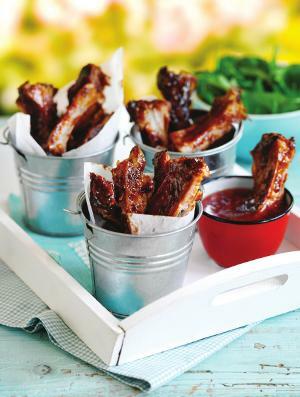 Place the racks of ribs in to a large saucepan with the beer and top up with water to cover the ribs. Bring to the boil, then gently boil for 35 – 40 minutes until completely cooked through and tender, drain well. In a large shallow dish, mix together the garlic, oil, ginger, chilli, ketchup, treacle and soy sauce. Add the ribs and brush them all over with the marinade until evenly coated. Leave to cool then cover and chill until ready to barbecue. Cook the ribs over grey coals of a barbecue or medium heat of a gas barbecue for 15 – 20 minutes, brushing with any remaining marinade and turning often until browned and heated right through. Serve whole or cut up with sweet chilli sauce. Alternatively cook the ribs in a preheated 200C, fan 180C, gas 6 oven for 15-20 minutes until heated right through.